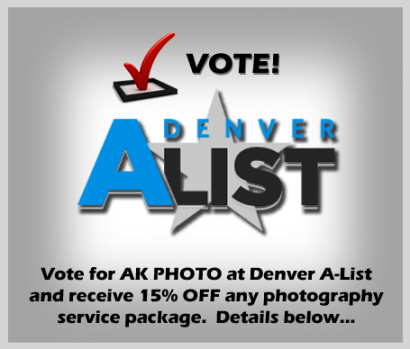 Vote AK PHOTO on Denver A-List and SAVE 15%! Visit the AK PHOTO at Denver A-List, and submit your vote. Facebook users can login with their Facebook account for faster login. After you have voted, visit your MY BALLOT page and print your ballot showing a vote for AK PHOTO. Present this print-out at the time of your shoot to receive the 15% discount. *Offer is only valid on photo services scheduled and completed prior to October 30, 2012. Please contact me if you have any questions.